Above: NARS Contour Blushes in Gienah and Olympia. This weekend, NARS released a long-awaited innovation: The Contour Blush. This sleek compact with two contrasting, yet coordinated, pans of finely-milled powder comes in three color combinations. The deeper shade is designed to add depth and warmth (contour) to the face while the lighter shade brightens and illuminates areas of the face where the light would naturally hit. Above: The NARS Contour Blush retails for $42. Currently available for pre-order online at Nordstrom and Sephora and debuting for in-store purchase on April 1st, this gorgeous trio will be a permanent offering in the NARS collection. A collective cheer from NARS fans and contouring devotees collectively resonates across the world! NARS Cosmetics introduces Contour Blush, the ultimate essential in makeup artistry and the secret weapon to creating natural-looking definition with a luminous finish. The beautifully balanced duos feature a lighter shade to illuminate the highpoints of the face and a deeper shade to enhance definition. Ultra-smooth, lightweight texture lends itself to a luminous finish and the specially designed contouring formula visual depth and dimension in a single swipe. To create the perfect contour on cheeks, apply the deeper shade of the Contour Blush to the hollows of the cheek and along the hairline, sweep the light shade across the cheekbone toward the temple to soften and highlight. Finish the look with a pop of your favorite blush shade on the apples of the cheek. Above: The full ingredients list. Above: NARS Olympia contains ivory and rosy tan powders. Above: Olympia in outdoor shade. Above: Olympia with a flash. Above: Olympia in direct sunlight. Above: Swatches of Olympia in direct sunlight. Above: Swatches of Olympia outdoors with a flash. Above: Gienah contains honey and amber powders. NARS Contour Blush in Gienah is described as a Honey/Amber combination, which I would deem to be fairly accurate. The amber contour powder is quite deep, commensurate to the Tom Ford Shade and Illuminate Intensity #01 and slightly warmer (versus the TF version's true brown hue). The honey highlighting shade is a warm beige that is actually deeper than the darker shade in Olympia. Gienah works best for N/NW/NC 30+ skin tones but those in the N/NW/NC 30-40 range who want a true highlighting effect may choose to use a separate highlighter as the honey shade is relatively dark. N/NW/NC 40+ skin tones should receive the full benefit of these complementary powders! Overall, Gienah leans towards the warm deep caramel end of the tan spectrum as opposed to the rosy blush-like propensities of Olympia and Paloma. Above: Gienah in outdoor lighting. Above: Gienah in direct sunlight. Above: Gienah and Olympia side by side. 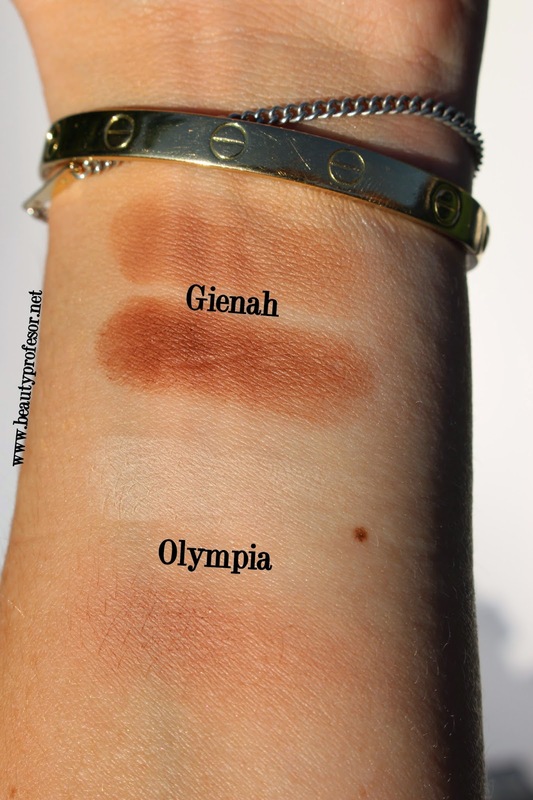 Above: Swatches of Olympia and Gienah in outdoor lighting. Above: Swatches of Gienah and Olympia in direct sunlight. Above: A Mondrian-esque vision of Gienah and Olympia. Bottom Line: In light of beauty lovers' obsession with contouring and the massive following that NARS has garnered over the years, the Contour Blush, with its shimmer-free texture and portable compact packaging, is sure to be a smash hit. I love the subtle and delicate Olympia for my winter and spring skin, however, by summer, I likely will need to take the leap to the more intense Gienah to create the same effect. The only shade left out of this post is Palomoa, a pink beige/deep rose combination that I can imagine would appeal to medium skin with rosy undertones or those seeking a pronounced blush/bronzer effect. In sum, the silky, blendable powder texture makes contouring a brilliantly easy endeavor; contour devotees and those who prefer products without shimmer invariably will want to add the NARS Contour Blush to their arsenal. These genius duos are highly recommended! Thanks for the heads up! I can't wait to swatch these in person. I absolutely love shimmer-free bronzers especially for contouring. My pleasure, Kath!! If you love shimmer-free bronzers, then these are so for you! What an amazing review, so comprehensive and have literally sold Gienah to me, think it would be perfect for my NC30-35 skintone. looking forward to it coming to the UK soon hopefully! Which NARS powder is suitable for an NW20? Also, what else are you wearing for fdtn, any powder, eye makeup, etc? I would suggest Olympia as I fear that Paloma and Gienah will be too dark! In my pictures, I am wearing a combination of Suqqu Frame Fix, Kanebo Sensai Cream and Ardency Inn Custom Coverage Concentrate for foundation (I am lately a fan on making a custom mix!). For powder, a touch of the Guerlain Les Violettes Pressed Powder in #02 Medium and Cle de Peau Concealer in Beige. On my eyes, I am wearing By Terry Ombre Blackstar in Brown Perfection, Surratt eyeshadow in Dore and Marc Jacobs Hi-liner in Blacquer on my waterline. Thank you, Nancy!! I am completely heartened by your supportive words and I am glad that you enjoy reading BP! What Cle de Peau Concealer color would match an NW20? I would suggest Ivory (on the light side) or Beige (which is a lovely balance of peach and pink)! You look amazing dear! 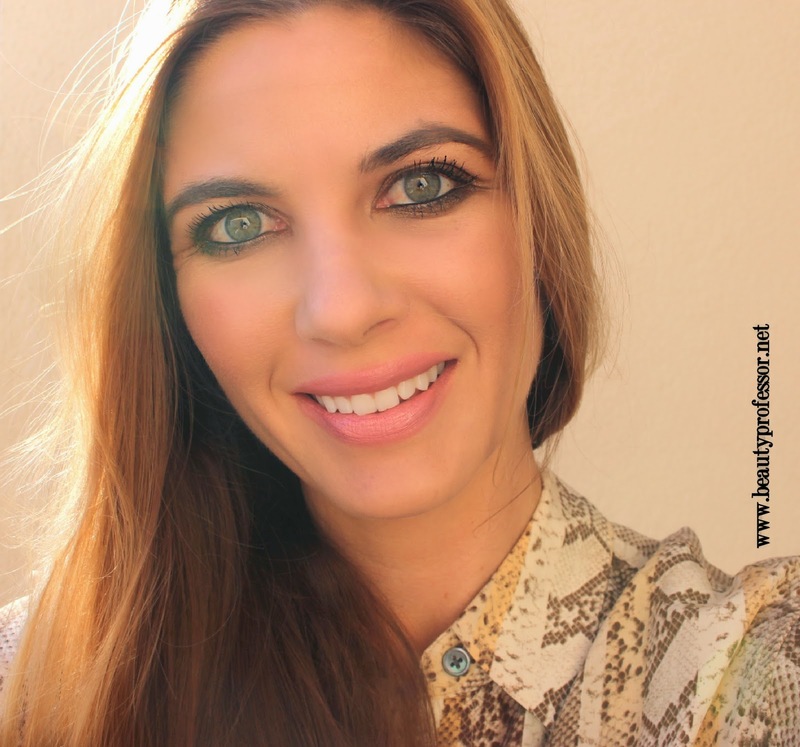 Love your makeup for its light and seem so natural. 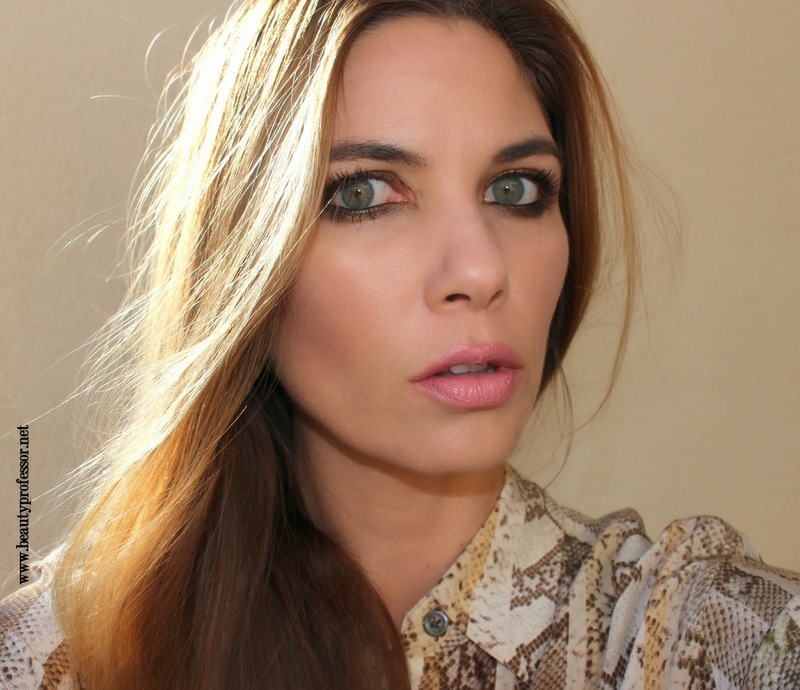 I prefer NARS Contour Blush in Olympia for its perfect for Spring/Summer. Thank you ever so much! The NARS Olympia is such a fresh offering for the warmer months...let me know if you try it! I am thrilled to hear that, Jasmine...thanks for sharing the good news! !